All components made of technical polymers are 100 % recyclable. 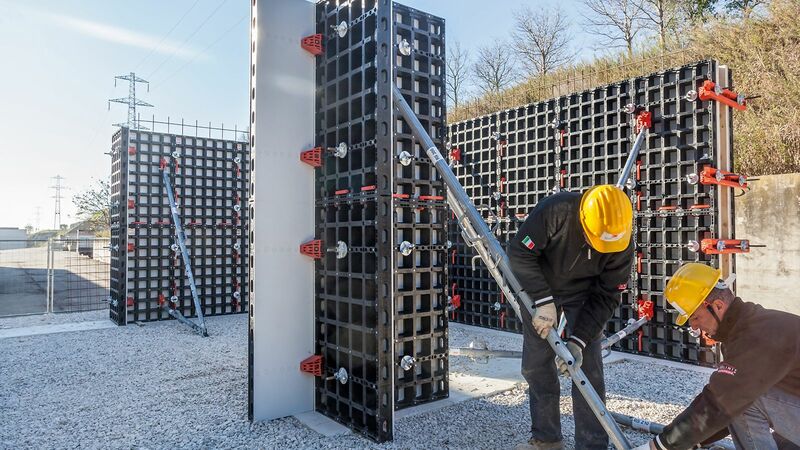 DUO is the innovative system formwork featuring a very low weight and extremely simple handling. It is not only the material used that is innovative, but rather the entire concept. 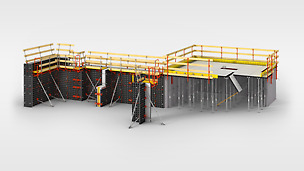 It allows for efficient forming of walls, columns and slabs using a minimum number of different system components. 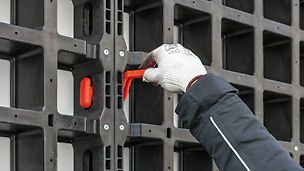 In addition to the panels including the formlining, most DUO accessories are made of innovative technopolymers. This newly developed material is extremely light and at the same time has a high load-bearing capacity. 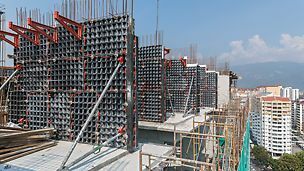 Apart from the material, the developers focussed on ensuring that the formwork system was easy to handle. Almost all operations with DUO can be carried out without tools, the working steps are easy to understand. 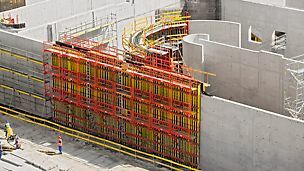 Even less experienced users of system formwork are able to work with DUO quickly and effi ciently. 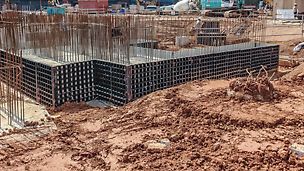 The fact that the majority of system components is used for walls, columns and slabs increases the performance additionally. 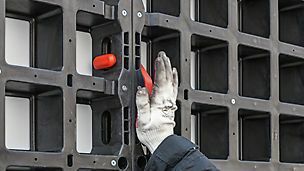 The core components of the system are the DUO panels including the formlining and the DUO Couplers, entirely made of technopolymers. 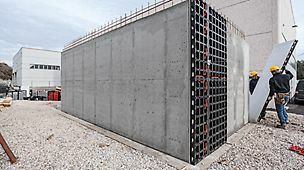 DUO Panels can be used for vertical and horizontal applications. Besides the investment and logistics costs, this also minimises the expenditure for the training of staff. Versatility is the special advantage of the system. 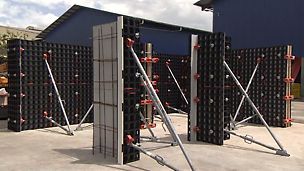 The panels can be utilised for forming walls, columns and slabs. In addition, all accessories such as couplers and corner posts have been designed so that they can be used for numerous applications. 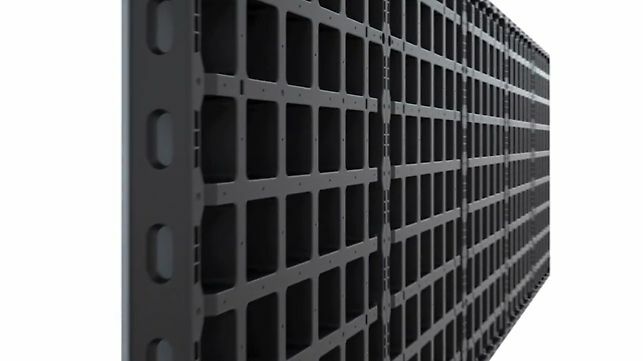 This concept reduces the number of different system components which in turn simplifies material requisitions on site. 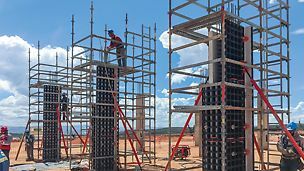 The advantages become even more evident when looking at the entire period of use of DUO: users carry out the various formwork tasks more efficiently, less storage areas are required and transport costs are significantly reduced. This concept also supports the principle of sustainability: fewer transports and considerably lower transport weights reduce the energy requirements for logistics. 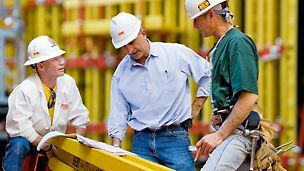 Simple operations, low weights and uniform system components allow for a very high productivity on the construction site. 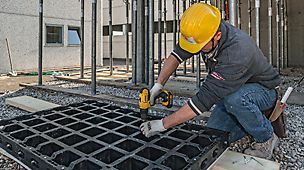 Working with almost no tools additionally reduces the risk of injury and prevents noise. 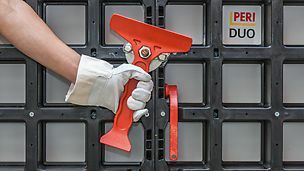 All DUO system components weigh less than 25 kg, making DUO a real hand-set formwork system than can be handled without a crane. 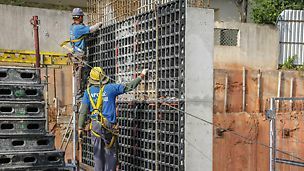 Working with low weights is less exhausting, resulting in improved concentration in everyday operations on the construction site and reduced risk of accidents. Furthermore, the composite system components have no sharp edges, which also minimises the risk of injury. However, if a crane has to be used, one with a lower lifting capacity is sufficient. This saves additional costs and energy. The best example of easy-to-use system components is the DUO Coupler. The DUO Coupler is guided through the frame openings and then turned 90°, without requiring any tools. 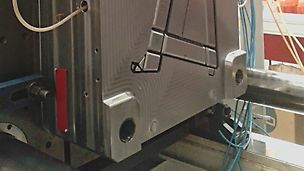 This connection ensures the panels are arranged at even levels. 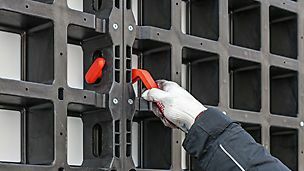 The fact that the couplers are flush with the panel after installation and do not protrude, allows for flat stacking of pre-assembled large-sized units. 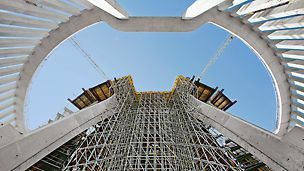 connections with wall thickness compensations and filler supports. The special highlight of DUO: easy replacement of formlining guarantees quick maintenance – without requiring any special tools or skills. DUO system components and the formlining made of technopolymers are very durable. 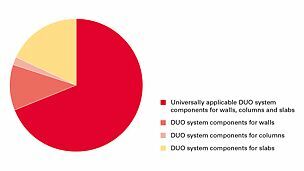 With proper use and maintenance, the service life of DUO components can be maintained over many years. Small identations or scratches in the formlining can easily be repaired. If required, the formlining is simply replaced. 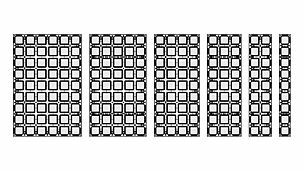 Formlining replacements are available in the panel sizes and are quickly mounted with a few screws. As with all system formwork, regular cleaning of the formlining ensures good concreting results and a long service life – this applies to the DUO system. There is almost no reaction of DUO with the concrete which means that cleaning requirements are kept to a minimum. Nevertheless, it is advisable to use release agent and to remove any concrete adhesions after every use. They can quickly be removed with the DUO Cleaning Device. During the production of DUO components no waste is generated. 100% of the raw materials are used in the manufacturing process. The components of PERI DUO can be reused many times. 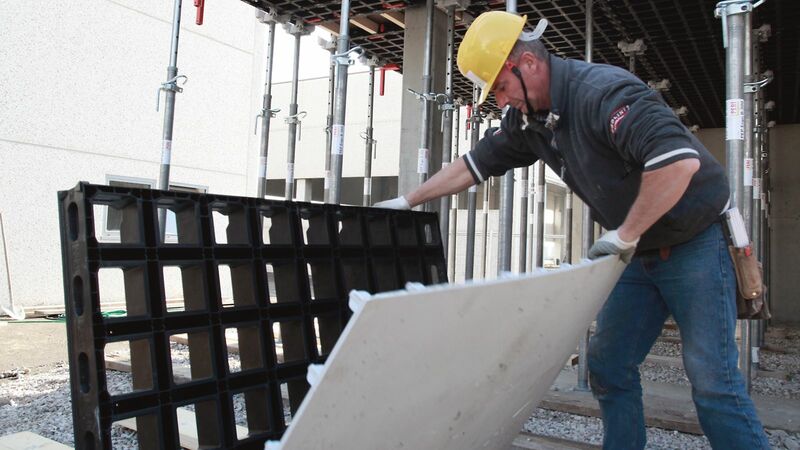 Formlining can be reused up to 100 times and additional to that it’s easy to replace on the jobsite. Should the formlining get damaged, it can be easily replaced on site so the frame can be reused even more often. Compared to conventional systems with approx. 5 reuses in average, waste is reduced to a minimum. PERI DUO is not only an ecological product but an ecological concept. 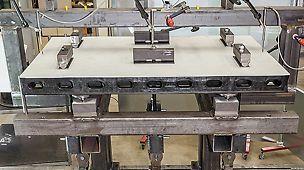 After the service life the DUO material can be milled by the producer and be reused for the production of new panels. In this way, a sustainable closed-loop economy is achieved. Do you have a question about PERI DUO? Write a message and one of our qualified PERI engineers will come back to you. Do you want to learn more about PERI DUO? Order the PERI DUO brochure with all product details. 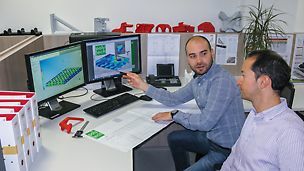 For several years, PERI has been carrying out research and development in polymer products. 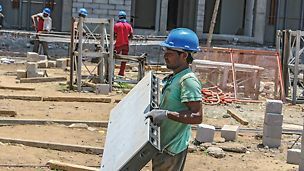 Thereby the focus is on the practical application of these materials in construction engineering. The result is a composite material on the basis of a polymer matrix. The material properties are optimised for the respective requirements of an application by adding additives. 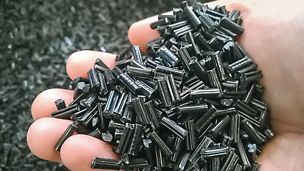 PERI material research focuses on technopolymers that are particularly robust and durable. 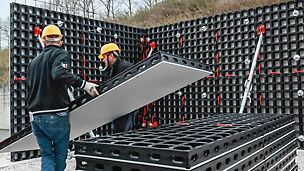 All development actitivies are aimed at the specific use of these polymers in formwork and scaffolding technology. Apart from simple slab stopend angles for the slab edge and other small devices, the formwork system DUO has resulted from this novel material. Technopolymers are very light compared to steel or even wood. This allows for faster working and saves crane time. 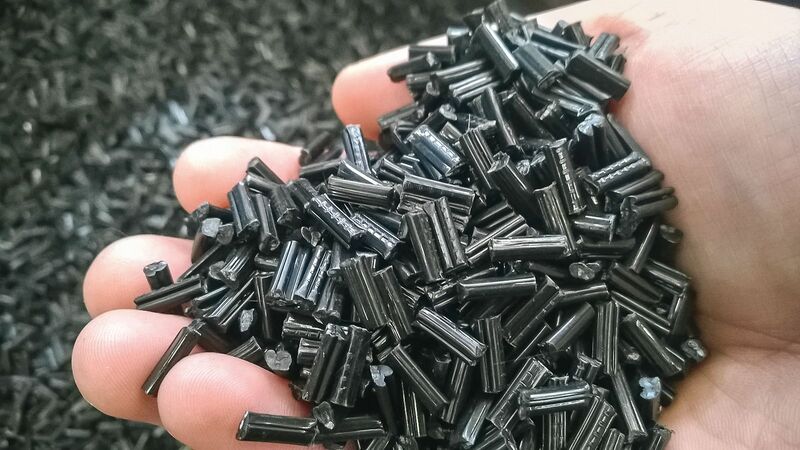 Technopolymers are shrink-free, develop no moisture expansion and do not rust. 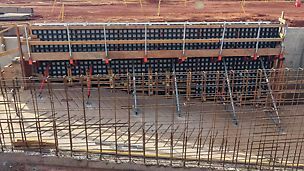 This makes their application in formwork systems so advantageous compared to wood or steel. The simple, flexible shaping opens up new possibilities for the utilisation of components and for clever multiple functions. The entire raw material used is processed into a product. No waste is generated during production. Technical polymer products are of a low weight. 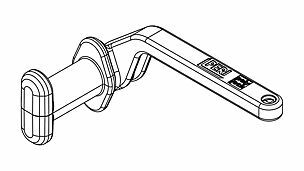 This minimises the transport weight and the transport costs and thus also exhaust gases. 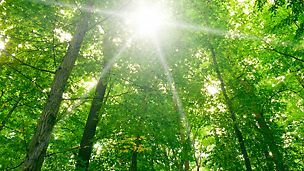 All components made of technopolymers are 100 % recyclable. Used material can be used to produce new products in terms of a sustainable recycling economy.